That spark of initial physical attraction – a red veneer married to a high gloss finish – pulled me closer. The Special Forty is a bass reflex design (rear ported), its nominal impedance comes in at 6 Ohms and it’s sensitivity is 86db. Specs be damned — for how handsome is this visually strikingly two-way? 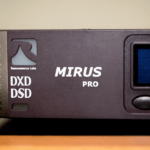 Unable to reliably ascertain the sonic merits of hifi gear at an audio like Munich High-End, would Dynaudio send me a pair from their Denmark HQ to Germany for some air time with music better loved by myself and DAR readers than the usual show dirge? Indeed they would. I’m into Aphex Twin, The Veils, Future Of The Left, Wolf Parade, The Future Sound of London, The Jesus & Mary Chain, Nina Kraviz, David Bowie and L.S.G.. Maybe you are too? 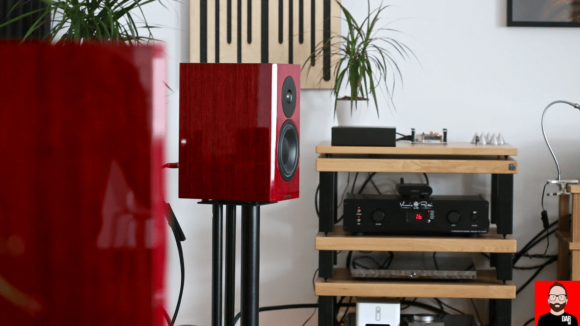 By July’s end I had a pair of the Special Forty at the DARhaus, in Red Birch of course, perched atop a pair of Atacama Nexus 6i speaker stands, orange tweeter protector removed and spilling with a Roon stream of David Bowie’s Low. On amplifier duty, the over-achieving Rotel RA-10 integrated. First impressions: big soundstage, smooth top-end, good bass presence. Not bad. Not bad at all. Through comparative listening conducted with familiar music, familiar electronics in a familiar (but flawed) room, we can further (and reliably) tease out the Special Forty’s audible personality. To wit, the Special Forty were compared to another anniversary model of note, the KEF LS50, now in their fifth year as my go to standmount. Vinnie Rossi’s LIO tells us that the Special Forty present a similar load to the amplifier as the LS50. Disabling the LIO’s MOSFET speaker module with a front panel button-press, pulling the AudioQuest Rocket88 speaker cable from the rear of the Dynaudio reds, placing them carefully on the floor before giving the LS50 pride of place on the Atacama Nexus 6i stands (filled with Atabites) and bringing the LIO’s speaker amplifier back to life, we note very little change in in-room SPLs. What I did note in the ensuing weeks of flipping back and forth between the two standmounts were significant qualitative differences. Plunging deep into Four Tet’s now extensive catalogue of albums, There Is Love In You gleefully and playfully shows us quite clearly that the Special Forty are stronger with micro-dynamic stop-start and percussive flicker. And nowhere is this more obvious than at lower volumes. A boon for those who don’t like to listen loud. The Special Forty is also more overtly airier than the LS50. The Dynaudio’s top-end extension better realises upstream changes. In my case, a cartridge swap on a Technics SL-1200G saw an Ortofon 2M Black draw greater finesse from Chris Frantz’s cymbals and brush work on Talking Heads’ swansong, Naked, than the Zu/Denon DL-103r (which sounds more like a rollercoaster thrill ride). The Special Forty’s 2.8cm soft dome tweeter, exclusive to this model, is a fresh take on the company’s Esotar design whose presentation I hear as beautifully extended and chocolate mousse smooth. That B-word isn’t a case of lazy reviewer’s choice. 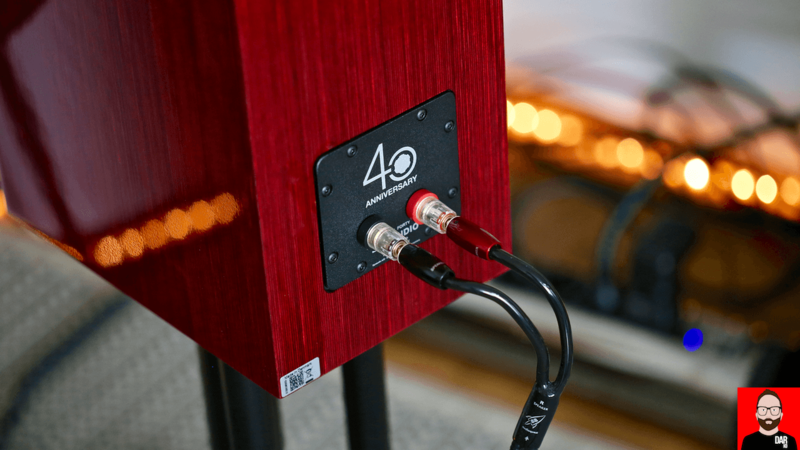 I mean it: the Special Forty really do make music sound quite beautiful; but they don’t have the air bite of the LS50 or the crazy amounts of top-end sizzle that we get from yet another birthday-celebrating standmount: ProAc’s Tablette Anniversary. Remember that ‘1000Hz’ – we’ll be coming back to it. On sonic humidity and degrees of additional warmth, the Special Forty edge out the LS50. There’s less of KEF’s between-the-eyes directness. 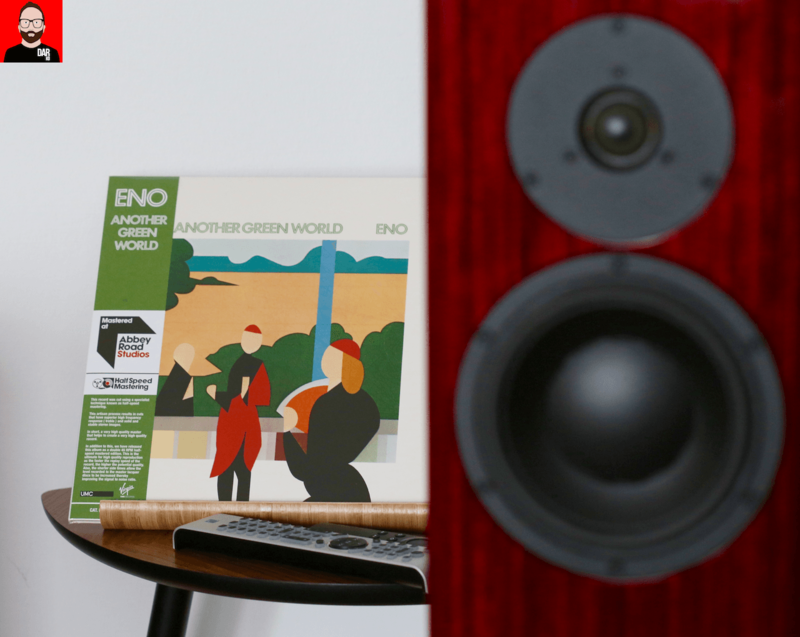 A little softening from the larger Dynaudio boxes allows us to listen to lower quality recordings like The Jesus & Mary Chain’s Honey’s Dead and Wolf Parade’s At Mount Zoomer – and do so for longer. Those seeking a seductive-sounding standmount could probably stop reading right here and seek out their nearest Dynaudio dealer (of which there are many worldwide) for an audition. This upshot is the suggestion of greater agreeability between the Special Forty and solid state amplifiers that err toward a steelier, cooler vibe. Playing swapperoo on a selection of my own – that Rotel RA-10, a Peachtree nova300, an AURALiC Polaris, a Vinnie Rossi LIO and a Devialet Expert 200 – I note bigger audible deltas between amplifiers than with the LS50 in play. My preference here falls to the Devialet, and by a significant margin, with its deft handling of subtleties and textures of The Future Sound of London’s My Kingdom EP. The Expert 200 powering the Special Forty is also where we hear bass notes really step out of the shadows. The Devialet’s Ethernet input plays catch on a Roon stream of Nina Kraviz’s Fabric 91 and I hear the low bass of Bjarki’s “Denise It Ain’t Easy 2” laid out more explicitly than with other amplifiers — and a step apart from the LS50’s take where those same bass notes’ presence is more suggested. Low frequency definition is cleaner in Special Forty hands but notably absent is the forward thrust of the KEFs, whose sound is more sports car than Dynaudio’s big, comfortable family saloon. Extracting this stellar low frequency performance is Dynaudio’s 17cm MSP mid/bass driver. Like the tweeter, it’s unique to this model, designed and made in-house at the company’s Skanderborg headquarters. Remember the tweeter’s natural roll off down at 1000Hz? It gives the Special Forty’s drivers a 3000Hz overlap. According to Dynaudio, this was a deliberate ploy. One way to keep the crossover first order: “…for the Special Forty we’ve taken our classic designs and techniques – and then ramped-up our unique Phase Alignment and Impedance Alignment technologies,” reads the manufacturer-supplied tech sheet. The Dynaudio loudspeaker’s other significant audible strength is soundstage height. A larger wall of sound than the KEFs married to a more substantive transmission of techno’s low frequency foundations makes for quite the compelling presentation. 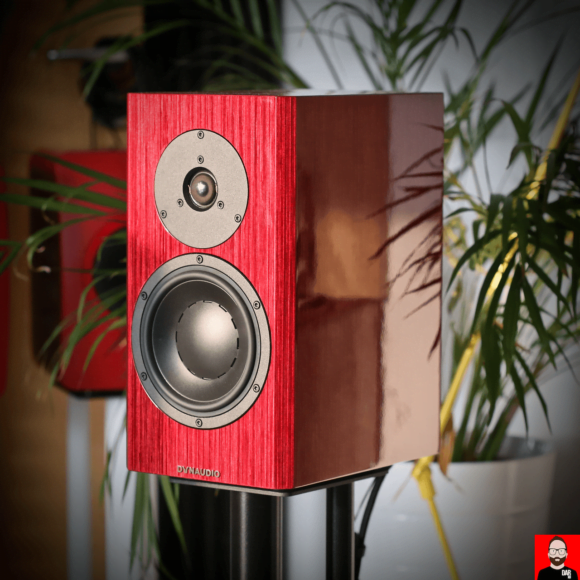 The LS50 score points for having the better stage depth of the two models; but it’s too little too late. On sound, the Special Forty comfortably justify their additional expense over the KEF. Sitting at €3000/pair – that’s two and a half times the street price of the Brits – the Great Danes darn well ought to. At this point, readers might wonder I dove into the Special Forty’s audible personality so swiftly? Where was the pre-amble covering appearance and materials? 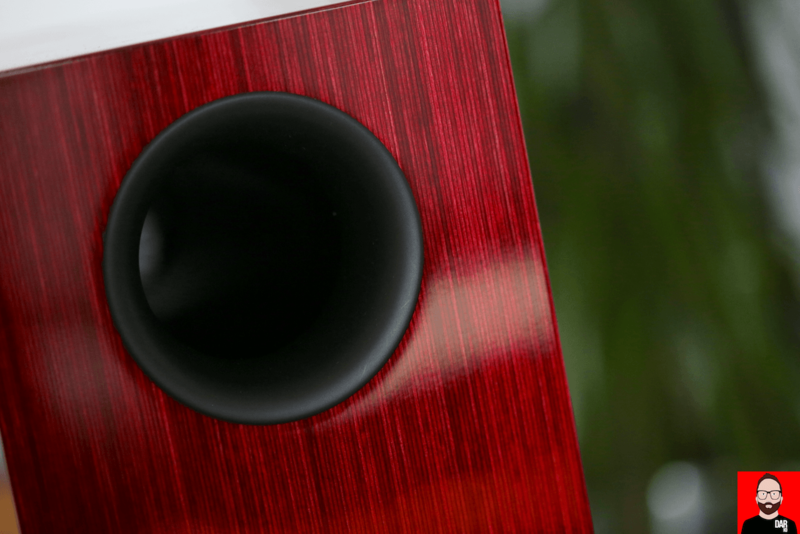 When a loudspeaker looks this good, the traditional review text structure must surrender to one where coverage of appearance and sound quality enjoy equal billing. “Don’t you wonder sometimes about sound and vision?” intones Bowie. Yes – I do. Both. And we’re not talking projectors or A/V receivers. Earning the Dynaudio Special Forty that S-word is the cabinet work. The core structure is 18mm MDF. A thicker MDF is used for the front baffle. The veneer provides the outer shell. The manufacturing process used to create the Special Forty’s veneer is more elaborate than we might expect: 1.5mm-thick wood slices are cut from birch wood in Finland. Each slice is coloured red or grey without paint (lest it obscure the wood grain) before many hundreds of slices are glued and pressed together to form a solid block. This block is then cross-cut again to create thin slices of veneer, this time though at ninety degrees to the original layers and so creating a pseudo wood/pin-stripe effect. Once the veneer is applied to the MDF cabinet, several layers of primer are added and then finished off by clear piano lacquer. The final stage is polishing. I subscribe to the view that a loudspeaker should sound great and look great. After all, the Special Forty cannot be tucked out of sight, sat in corners or placed on top of cupboards, without severely curtailing their audible performance. To do so with the these luxury boxes would be to instantly trash one’s spend. The Special Forty demand speaker stands and a little distance from room boundaries. Dynaudio include two sizes of foam port plugs in the box for those who can’t put a meter or more between the Special Forty and the front wall. Distanced from walls, like a stylish coffee table or lamp, loudspeakers must therefore also be enjoyable to look at. The Dynaudio Special Forty meet this brief head-on. 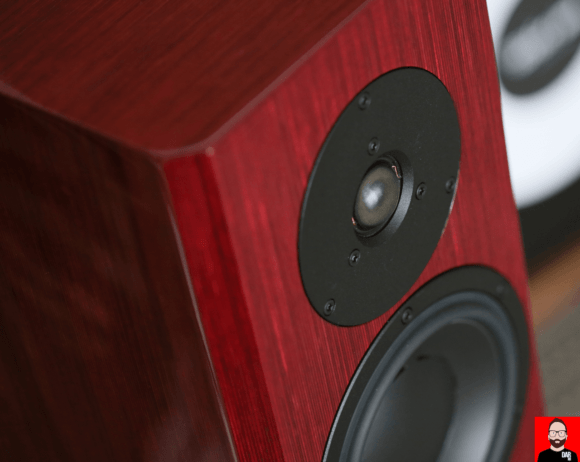 In the red birch, a speaker with oodles of wow factor. In the grey, a more understated look for those whose tastes lean toward the conservative (not that there’s anything wrong with that). And that’s the point here: the Dynaudio Special Forty should be viewed (and heard) as splendid sounding pieces of audio furniture. 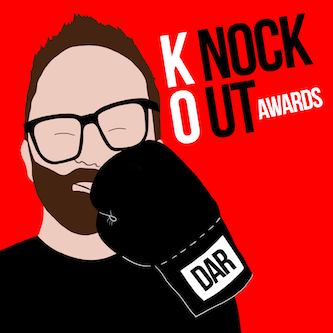 Loudspeakers that dance on the grave of the audio reviewer cliché that ‘they look as good as they sound’. 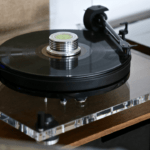 Next article Needle-dropping w/ the Pro-Ject 6 Perspex – results!